Not only attract visitors with the majestic scenery of the mountains, the land Highland also treats guests grilled chicken dishes with bold cultural identity. It would be a mistake not to mention the grilled chicken from fellow here (with fire place called chicken sa). Simple dishes made from backyard chicken, marinated and then cooked by steam train but the aroma of dishes spread on inviting that visitors can hardly ignore. Chicken garden is cleaned and seasoned with spices before being cooked. According to many, this dish comes from the Ede ethnic people in Buon Don (Dak Lak), from here, this dish spread throughout the Highlands with many versions and different ways of processing. But the most important thing is that it retains the full flavor characteristic of his delicious. 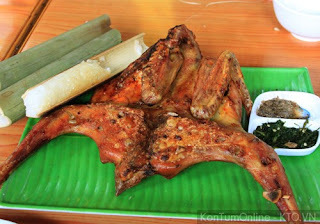 To make this dish, the most important raw material is chicken. Based on the experience of the people, the kind of backyard chickens, mostly eating spillage, insects … the chicken fresh and sweet taste make. Grilled chicken should only choose the hen on less than 1kg. If large chicken for meat is chewy, chicken little too smelly again … so it will not taste good. Chickens are not placed directly on the coals, but always keep your distance, mostly cooked by heat. Chicken after clean surgery beheaded along memories he broke flattened out. 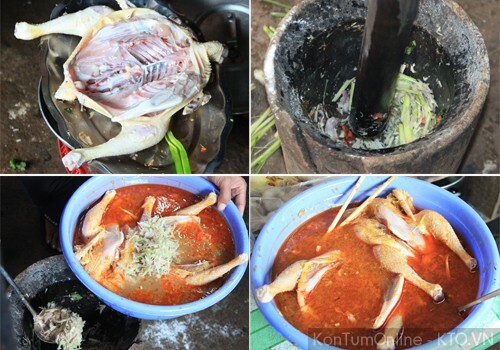 Chicken marinade was prepared from onion, lemongrass, garlic puree mixed with pseudo five-spice powder, honey, pepper, fish sauce, salt and forest leaves … To chicken soaked, before marinated, people used knives rammed into the small hole on the body of the chicken. 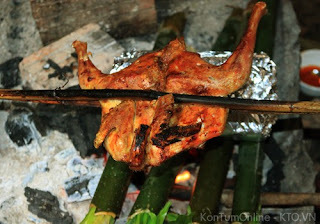 Chicken marinated for 30 minutes to an hour, then for mid non split bamboo, tightly and cook on heat of fire. Grilled chicken is often served with rice, and salt é. Just as long as there was enough to visitors fascinated. During baking, the chicken always come are to be browned, crispy but not burnt. In the chilly afternoon in the mountains, are gathered around the fire between the floor and hand back each chicken is cooked slowly, nothing interesting by. Baked chicken is shredded into pieces, then eaten with salt é leaf (a leaf spices are abundant in the mountains Highlands, seeds are crushed with salt, green peppers) and the soft plastic tubes of rice, cooked , delicious. Flavor, sweetness of the chicken in the charming harmony, é sting of salt that visitors fascinated when enjoying, then the remote Highlands, is once again want on this land to enjoy chicken delicious grilled this attractive.